The BOSS HOSS is an American made motorcycle powered by a small block Chevy 350 V8 or 502 Big Block V8 engine. 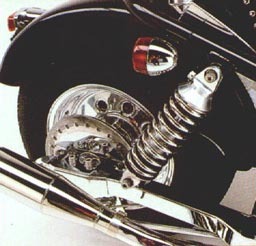 This high performance, well engineered motorcycle has a total weight of 1100 to 1300 lbs. A balanced, low center of gravity design makes the Boss Hoss a dream to ride whether cruising around town or touring the country. The BOSS HOSS has a specially designed, fully automatic transmission shifted manually from a standard motorcycle style shifter. Just push down on the shifter to engage the transmission from neutral to first, then at the desired rpm and speed push it down again for overdrive. In overdrive the engine will turn a pleasant 2300 rpm at 70 miles per hour which generates 30 miles per gallon and a range of more than 300 miles. 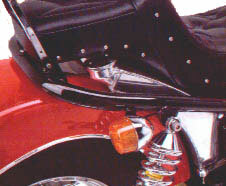 Reverse is engaged from neutral position by lifting up on the peddle and simultaneously holding a button in, located on the left handle bar just below the left turn signal switch. Reverse is powered by the engine and is specially designed to engage smoothly and be very controllable for a rider friendly feature. The BOSS HOSS rides like no other motorcycle in the world. The vibration free acceleration will amaze anyone who rides it. The control compares to bikes half its size. Just imagine the dependability of a small block Chevy engine, the sound of a finely tuned street rod, the acceleration of a pro dragster, and the distinctive beauty of a hand built American machine... AII this in a street-legal, cruise/touring class motorcycle. The BOSS HOSS. The American made "Boss Hoss" is designed as the ultimate cruiser or for touring the country with the dependability of V8 or V6 Chevy power under your seat. A 2 gallon fuel reserve under the seat equals approximately 50 miles at highway speeds. Available on 2002 Model as optional extra. 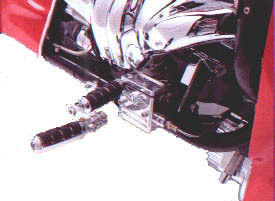 Swing Arm and Rear axle assembly with adjustable ride shocks and easily accessible caliper brake system. Also the dual exhaust has the unmistakable mellow tone of Chevy power. Boss Hoss custom rear master cylinder made of high quality billet aluminium exceeds U.S. D.O.T. standards. Also, precision fit exhaust shield and standard GM alternator. 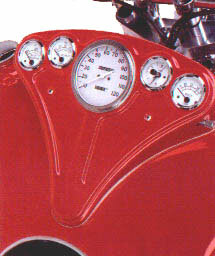 The Boss Hoss gauge panel gives rider standard instrumentation at a glance. Email or write, phone or fax Brian Ford Engineering regarding Boss Hoss Cycles in New Zealand or if you live elsewhere click here to find your nearest dealer.